With the Boxing Day start of the Rolex Sydney Hobart Yacht Race fast approaching, registrations are open for what will be the blue water classic’s second year of partnership with Virtual Regatta, the world’s leader in cutting-edge sailing simulation games. Click here to register for the 2018 Rolex Sydney Hobart Yacht Race Virtual Regatta. Following the enormous success of its debut last year, with more than 30,000 virtual sailors taking part, Virtual Regatta is back to again permit sailors all over the world to share the excitement and fun of racing against Rolex Sydney Hobart competitors. The game, which is available free online (Mac and PC), and on Android and iOS from any app store is fun to play, easy to learn, and challenging to master. New and experienced users can compete and test their skills alongside other sailing enthusiasts from all over the world, in real time, en route to Hobart. The game allows users to customise their boat, select the sail configuration, choose the best tactical route and skipper their virtual yacht to victory across the finish line in the Derwent River. Participants can also set up a team of up to 50 members in Virtual Regatta, allowing you to see the other team members in the game interface, and to communicate via your own private social media channel. For fans of the Rolex Sydney Hobart it’s easy to be part of the world’s largest sailing community, whether a novice or an expert sailor. The winner in 2017 was a virtual sailor from Germany, with the first Australian sailor in 5th place a mere 1 minute, 8 seconds behind. The boat in 2017 was a Clipper. This year the virtual boat is a Class 40, the same boat as recently competed in the virtual Route du Rhum alongside the real boats in that race. 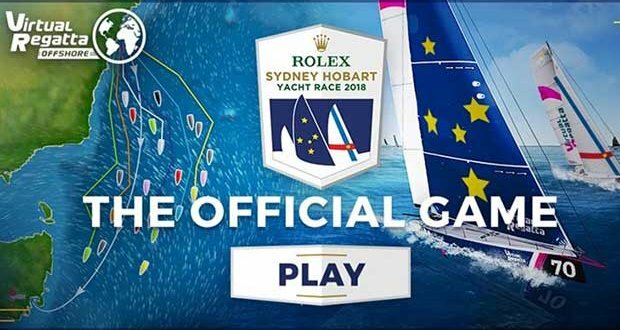 The Virtual Regatta race starts at the same time as the Rolex Sydney Hobart Yacht Race (1pm AEDT, Sydney time), and the game engine uses the exact real-life weather conditions as are being experienced by the competing yachts to power the virtual yachts to Hobart. The winning Australian resident competitor (identified as such via their VR profile) will receive a CYCA merchandise voucher valued at $200. For all the latest information on the Rolex Sydney Hobart Yacht Race visit www.rolexsydneyhobart.com.